If you’re feeling a bit queasy from the night before, we should probably warn you now that perhaps this isn’t the article for you. A man from Texas managed to catch a flesh-eating infection after showering barefoot at the gym and as you probably expect it’s a whole load of NOPE. Can the mind vomit? Yes, yes it can. 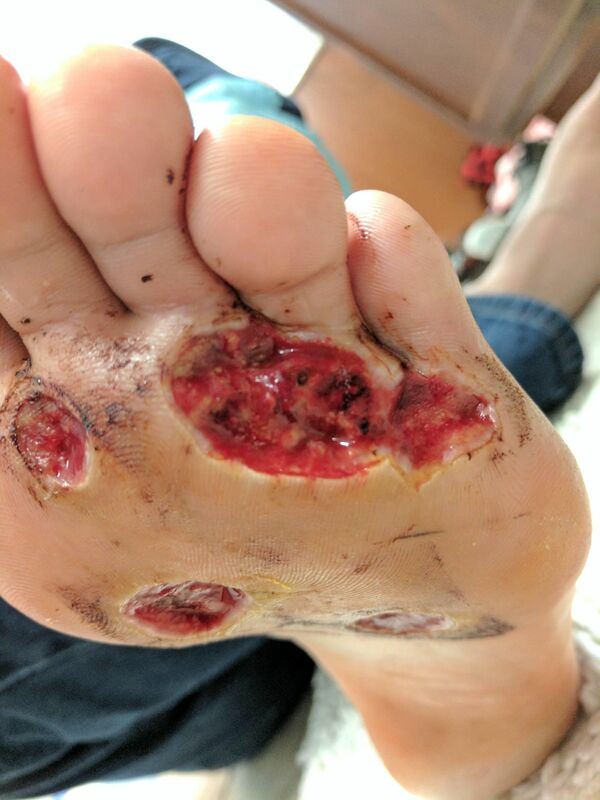 The man, who has not been named, says he originally thought it was just a growing wart, but that soon turned to five ‘warts’ and eventually spread across his foot and created open wounds. Despite trying everything to make it better, the wounds only continued growing. Fortunately, he’s since had skin graft surgery to correct it, but wanted to share the horrific photos in a warning to others. The man, who wishes to remain anonymous, was a listener of The Rod Ryan Show on KTBZ-FM The Buzz, and sent an email to them about why you should always wear shoes in public showers. He explained how he was training for a marathon and visited his local gym during his lunch breaks. Not wanting to go back ‘sweaty and smelly’ he made the decision to shower barefoot- which proved to be a very bad error. The man soon noticed there was a spot at the bottom of his left foot, that began to itch but he didn’t think anything of it. I went through the same treatments, but at a much higher concentration. My entire foot would swell and the pain was so bad, I couldn’t walk. I couldn’t even put my leg down as the blood rushing to my foot would cause the skin to swell and put me in excruciating pain. After several months of going through this horrific pain, the man decided to undergo surgery in February and the wounds finally started to close up. Two months on from his surgery, he will still need at least one month before he can walk properly. With that in mind, the man had a pretty stark warning for anyone thinking about going barefoot to their next gym sesh. Do yourself a favour, wear shoes in any public area where there is water. This virus thrives in those areas. The scary thing is, the virus can live for over two years on the surfaces as well. Take care of your feet so they can take care of you.